Trivium, one of the few bands that have flourished in the 2000’s and managed to garner major respect from many Metal fans. Always trying to remain fresh, the band have always tweaked their sound a bit. Ranging from Metalcore banger ‘Ascendency’ to the Heavy Metal infused ‘The Crusade’, the band has strived to constantly show off their versatile sound. ‘Vengeance Falls’ is no exception. A huge leap compared to its predecessor, ‘In Waves’, this is an album which will either loose fans or win some. Potentially both at the same time. Different to all other releases, this truly pushes the boundaries of what one band can do. Within their ten year career, never has a band been able to show how well they can expand their horizons. This is special and here’s why. 'Vengeance Falls' is so drastically different to all its predecessors, even if its opener doesn't show it. This dive into strange, unexplored territory begins with 'Brave This Storm'. A song that does feel like an out-take from 'In Waves', this is standard, expected Trivium fare. Great vocals, both with Heafy's clean vocals and the backing screams, solid riffs with some excellent drums and unique bass, it is everything you could expect from them, including the usual kickass solos that the band have made a staple of. So, although a great song, there is nothing that different from the bands norm here. But then you enter the title track of the album, entitled 'Vengeance Falls'. This is where things get a bit different. 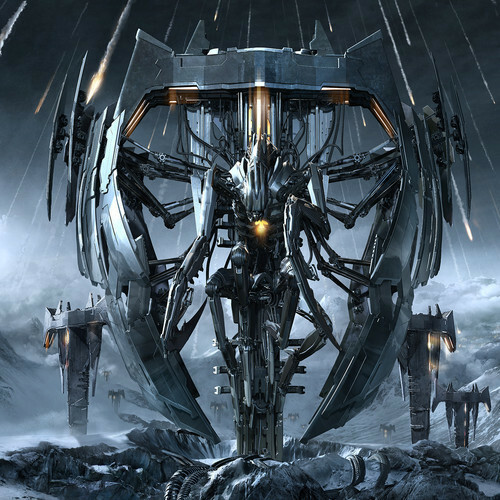 It does feature the great vocals, riffs and the normal stuff to expect from Trivium but there is something different here. It is rather chaotic but features some memorable hooks. Still, to identify what is different here is rather difficult but you can tell that this isn’t standard Trivium fare. A great track overall but something is a little different here. You then move into the single of the album, ‘Strife’. Now this is where the difference is so blatant that it hits like a hammer. The riffs here a little different, the layout is a little stranger but, msot of all, the vocals are being done with a different approach by Heafy. It is an approach we have never seen him do before but it makes the track exciting. However, you either love it or hate it. It still features catchy hooks and riffs and drums and bass but it is something unique from the band. The album moves through songs ‘No Way To Heal’, ‘To Believe’, ‘At The End Of This War’, ‘Through Blood And Dirt And Bone’, ‘Villainy Thrives’ and ‘Incineration: The Broken World’ before slipping into the ending track ‘Wake (The End Is Nigh)’. All of these tracks are different from each other, although there is still the Trivium core here. But everything is still a little different with this release. Whether it be vocals, bass-grooves, riffs or drumming, it is different. Subtle changes here and there but yet are noticeable to anyone who knows the band well. All the songs are truly great to listen to but I have a problem, only minor but still a problem with this album. With a majority of the tracks on this album, there seems to be parts which don’t quite work. Little things that seem to be there to fill up more time. I’m not saying it is a big issue but I think they could have maybe tried something that works a bit better. However, that is its only flaw. Still a great album and full of excellent material. The Deluxe edition is also impressive with three bonus tracks; ‘No Hope For The Human Race’, ‘As I Am Exploding’ and a cover of Misfits ‘Skulls… We Are 138’. These are all excellent in their own right and are more closer to the older Trivium but still great fits for this album. The production here is great too. Produced by Disturbed/Device master-mind, David Draiman, this is truly amazing to listen to. Draiman clearly knew where to steer the band and made one of the finest sounding albums possible. Everything is tight and fits together, making this one heck of an impressive sounding album. It’s wonderful to see the band make an album that is so perfectly mixed. Now, this album is something fascinating. Trivium at heart but very much different to their previous releases. Although it seems like Draiman may have added in some of his Disturbed style to make things a bit more interesting, it is still Trivium. The vocals are still Heafy, with a slight Disturbed edge to them. But it does make it a little more unique to hear from such a big band. The drums are amazing, as always, the bass is well placed and has some serious, often intense, grooves and the guitar work is great, with some excellent riffs and some of Trivium’s best solos to date. However, the quality of this album is slightly dampened by some parts which just don’t seem to work here. But this is still a fantastic album, even if it may require a second listen to get really into it. Overall a very impressive piece of Metal from a great band and is something to be strongly appreciated.